After “What gear should I get?” the question I am asked the most is “How can I get better pictures of high school football at night?” As I have mentioned before, my path started with high school sports exclusively. Budget-conscious school districts aren’t usually thinking about photographers when they buy field lighting, in fact sometime I wonder if they’re thinking about whether or not the players can even see the ball. It’s easy enough to set up remote speedlights or strobes for basketball, wrestling and other sports, but it’s just not possible to do it for football. So most people run up the ISO and shoot at borderline shutter speeds, and just deal with the resulting motion blur, color casts, and noise/grain even on the top-of-the-line bodies. 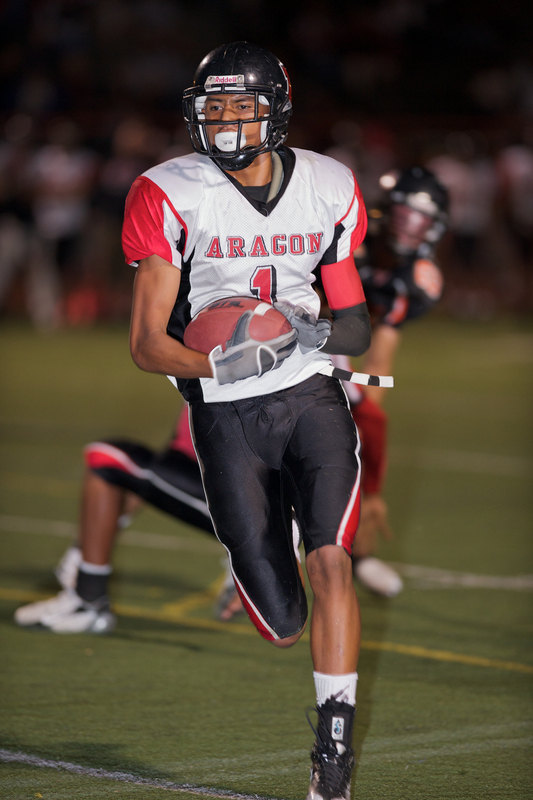 I wasn’t happy with these tradeoffs because I was using high school football as a stepping stone, and I wanted pictures that I could sell to parents, but also could run at decent sizes in the local papers I was shooting for and go into my portfolio. There were times when I could pick the games I wanted to cover, and I would always choose the schools that played either at college fields or the best HS lighting. But sometimes assignments would take me to fields that were poorly lit, including one field lit with portable construction lights powered by diesel fuel. And if you’re a dad- or mom-tographer (a term I just learned from one of our readers!) you’re not going to have a choice where your kid plays. I got pretty tired of having to do a bunch of color correction/noise reduction on tight deadlines – and still not being very happy with the results – so I started thinking about a solution. My first attempt was on-camera flash. But as anyone who has used even point & shoot cameras, red eye is a big problem when shooting people. Take a more powerful flash, couple it with a long lens, and red-eye happens on nearly every picture. The pictures from that first game needed just as much work as the non-flash pictures, removing red-eye substituted for the other adjustments. Before the next game I bought a Stroboframe flash bracket that wedding and event photographers to get the flash off axis from the lens. This didn’t work either, and I learned the hard way that the longer the lens, the further away the flash needs to be to get off-axis. And using 300mm and 400mm lenses means that a flash bracket is never going to be able to get the flash off-axis enough; the angle of difference just needs to be bigger to avoid red-eye. 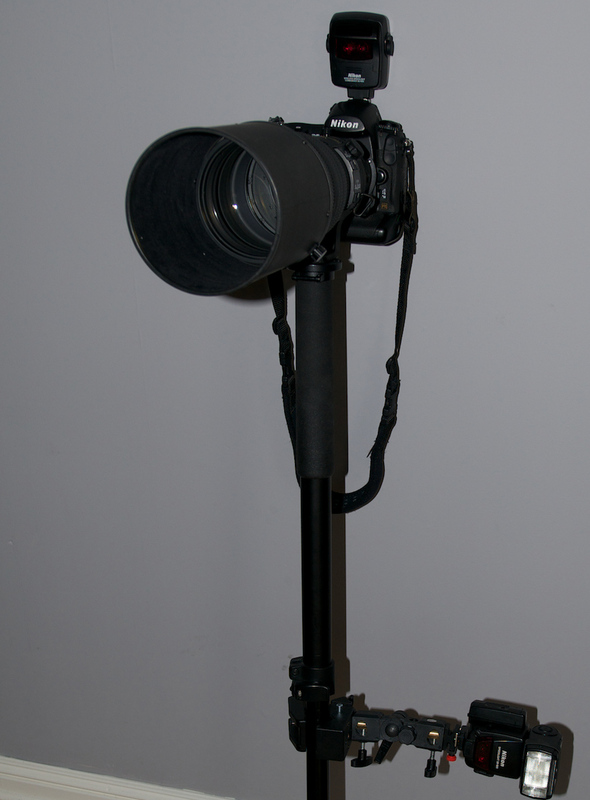 Finally I figured out that attaching the flash to the monopod would increase the off-axis angle, and eliminate red-eye in most pictures, leaving the questions of how to attach the flash and how to fire it. I had some studio gear at the time and used a Photoflex Multi-Clamp bolted on to a Manfrotto Super Clamp clamped to the monopod. To get the flash to attach, I used the Stroboframe cold shoe as it is far better than the one that comes with the Multi-Clamp. This is a very solid set up that can take the bumps that come with running up and down the field. Next I had to figure out how to best fire the flash and control exposure. The simplest (and most dependable) method is a cable that connects the camera to the flash. These vary based on the equipment that you have, but can be found easily and relatively cheaply. But I didn’t go with hardwiring for two reasons: 1) this setup is already a handful, and I didn’t want to risk getting tangled, and 2) I didn’t want to have to bend down to adjust the flash output. So for me, I settled on using a Nikon SU-800 to control/fire the flash from the hot shoe. With the SB-800 flash set to either remote or TTL, I was able use the SU-800 to control power either on TTL using exposure compensation or on straight manual depending on how far away the play was. This worked to the point that I was getting properly exposed pictures with no noise and no need to correct for color temperature. The only drawbacks are frame rate (totally dependent on how fast the flash could recycle for any given power) and the somewhat odd shadows that come from having the flash below the lens. A couple of closing points: I have found that shooting at your camera’s max sync speed (usually 1/200-1/250) is best. The flash will have to be powered high enough to freeze the action (2 stops over ambient is usually the rule of thumb.) Your ISO will obviously be much lower than without the flash, but high enough that it will let some ambient light into the exposure. From there, adjust your camera/flash settings to suit the conditions and the look that you prefer. When I was doing this, I was looking for as much ambient light as possible because I found having the background somewhat visible added depth and made the pictures look more natural than if the exposure consisted only of light from the flash. If you get to the field early, you can dial in the exposure during warm ups and be set for the game. 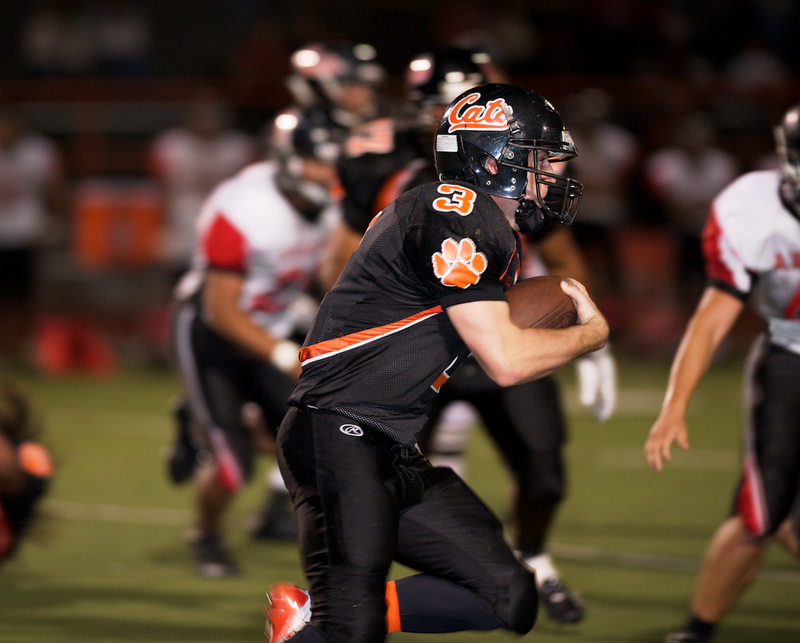 Some people have expressed disbelief that I was able to use flash at high school football games. I’m not going to get into a discussion about it because I don’t know the rules in every state and every league. I will say that no one ever stopped me from using this setup, and the people with whom I have shared this setup have not had any problems either. Most of the time, if you act as if you know what you are doing and have done it before, you will be left alone. A little discretion goes a long way, however. The first time you let a full power flash blind a receiver who’s trying to catch a pass, will be the end of strobing football at that school. With a couple of months left in high school football season, hopefully this will help some of you get some good pictures. I’ll so another one of these for HS basketball if there is enough interest. Thanks again Matt for helping the momtographer out! My son doesn’t play many night games yet, but with I see that increasing soon. I have to remember this technique for the future. Your insight on HS level sports is very helpful. Thanks for sharing your ingenuity with us! I saw a guy at a high school game with a similar rig and was very curious but unable to get close enough to talk to him. Thanks for the info Matt, can’t wait to try this out. Your setup for poorly lit HS gyms would be great as well. LIsa & Tom, happy to help. Ryu, you’re on your own.